The daughter of a middle-class family of Sephardic lineage, Leah Lazarus was 17 in 1795 when she wed 32-year-old Mordecai Cohen. Following the fashion of the day, in this portrait she wears generous ruffles and lace, with a locket or pocket watch suspended from a chain attached to her bodice. 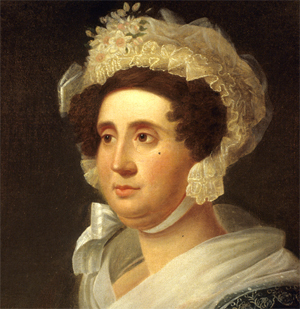 This portrait of Leah Lazarus Cohen was painted by John Canter. Born in St. Croix in 1782, Canter came to Charleston in 1800. Employed in 1806 as a drawing master at the College of Charleston, he maintained a studio and a practice as a portrait painter in the city from 1809 until his death in 1823.